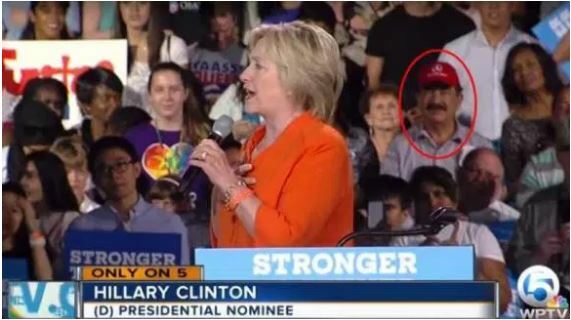 America, Do You Really Believe It IS By Accident That These Muslims With Questionable Associations Showed Up At Hillary Events by Accident? Unless you had taken a course in advanced agitprop, you would not have recognized that Seddique Mateen, the father of the Orlando nightclub shooter, was a plant. He was part of the propaganda show for Hillary Clinton, now playing to sparse audiences from coast to coast. The show is produced and directed by radical “let it all hang out” leftists, in coordination with misogynistic Islamic supremacists, who believe in forced marriage of children under 13 and clitorectomies. The purpose of Mateen in Florida, a state Hillary needs to win, was to change the narrative, since Khizr Khan was so successful in changing the narrative at the Democratic National Convention. Those “selected” for front- or second-row status at a presidential candidate’s event are hand-picked for ideology, gender, race, or ethnicity. There is no chance that the Clinton show did not know of and approve of his appearance. Clinton needed to change the narrative for two reasons. First, her poll numbers arenot really up as Pat Caddell, a professional pollster, has attested to, especially if you look at the abracadabra methodology. It’s a classic case of disinformation. Who is Khizr Khan Really? Certainly NOT Who You Have Been Led To Believe He Is! Ghazala and Khizr Khan loved their son I am sure and his death serving in our military was very honorable. But why were they picked to speak at the DNC convention? Because of Khizr's dealings with Hillary? Why not some of the parents from Benghazi or Extortion 17 or any of the other thousands of parents whose sons and daughters have lost their lives fighting for our war mongering politicians? There are thousands of Gold Star parents out there who did not allow themselves to demean their sons or daughters death by supporting a candidate who has a long history of deals with the parents. ORLANDO AIRPORT TO SET UP A PRAYER STATION - A WHAT? ​Let's call it what it is a Mosque! At a cost of $350,000 the airport has finally decided to do this. I don't know about you but I don't feel safe flying any more anyway. “Let’s call this what it is—a mosque,” Rev. Franklin Graham commented. “The airport already had an interfaith prayer room since 1983 (with prayer rugs available in it)—but that wasn’t enough.” Graham then goes on to comment on the clear double standard that has been set. “How loud do you think the objections would be today if they spent $250,000 in taxpayer money to build a new prayer room exclusively for evangelical Christians?” he asked. “Or for Jews or Mormons or any other group? Why do Muslims get preference?” Are you idiots using Florida's money to do this?